"I've never had a conversation where it didn’t lead to that question." 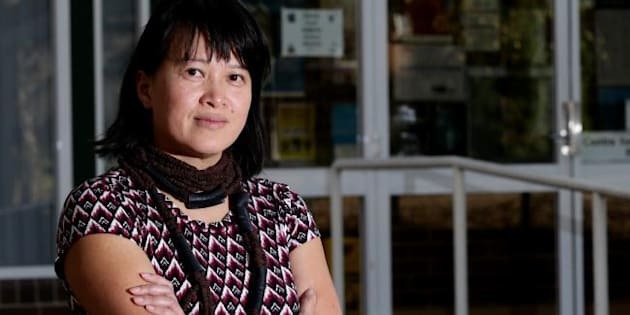 It's a question addictions specialist Professor Nghi Phung, 49, used to ask her patients. Now she has lung cancer, she's asked the same thing by strangers. Prfoessor Nghi Phung knew the symptoms all too well -- a cough that just wouldn't go away, a steady wheezing breathe in the night. But despite having spent half her life as a doctor treating addictions like smoking, having lung cancer was the last thing on the mind of the mum of three. "I didn't feel at the age of 49 that I was old enough to have lung cancer and also being a non-smoker from a family of non-smokers, that didn't really put lung cancer on my radar at all," she told HuffPost Australia. Yet despite having never touched a cigarette, Phung faces constant judgement from strangers. For four out of 10 Australians, the first question they would ask lung cancer sufferers (without first expressing concern) is: Do you smoke? One in 10 think they "got what they deserved". "I've never had a conversation where it didn't lead to that question. "You're certainly constantly having to explain yourself -- and if you're not asked, then that's actually worse because then you're left wondering whether they think you've been smoking and are too embarrassed to ask." Lung cancer kills more Australians than any other cancer, yet of all OECD nations Australia is the least empathetic towards sufferers of the disease. "What pains me is knowing that my three children would grow old without me being there to guide them." More than half of Australians admit to having smoked at one time in their lives, yet one in three believe people with lung cancer are their "own worst enemy" who "only have themselves to blame", a new survey by the Lung Foundation shows. And one in ten went so far as to say that lung cancer sufferers "got what they deserved". And this stigmatisation is effecting the medical treatment, as well as the mental health, of sufferers. "People with lung cancer and lung disease generally are at high risk of anxiety and depression," Lung Foundation CEO Heather Allan told HuffPost Australia. "They feel isolated; they feel less willing to put their hand up and admit to the fact that they have lung cancer or lung disease. If they're not admitting to it, then they're not seeking the appropriate support." One in three women and one in ten men who have lung cancer have never smoked. Other risk factors for lung cancer include air pollution, exposure to second-hand tobacco smoke and exposure to asbestos. There is also a genetic element, with some people carrying genes placing them at higher risk. Nghi Phung, 49, was given three to 12 months to live. "Anyone can get lung cancer," Allan said. "Smoking is a significant risk, of course, but so is smoking a significant risk for heart disease, for breast cancer, for vascular disease, for a whole range of chronic disease. But we don't see the same community attitudes for those diseases as we see for lung cancer." Lung cancer kills around 8,500 Australians every year -- more than breast cancer, prostate cancer and ovarian cancer combined. Six out of seven sufferers will die within five years of being diagnosed. Yet funding for research and treatment is sadly lacking compared to other common cancers. A 2015 study found this was due to the stigmatisation of the disease. "I have never seen a fundraiser just strictly for lung cancer," Phung said. "I just wonder how it would go down if we were to have a lung cancer charity dinner -- whether it would get the level of support of, say, breast cancer." When Phung found out she had lung cancer in February, she was given three to 12 months to live. Having gone through chemotherapy, radiotherapy and immunotherapy, she has few options for further treatment left, but she refuses to let the cancer -- or the stigma she faces -- get her down. Nghi Phung hopes that sharing her story will help raise awareness about the debilitating and deadly disease. "What pains me is knowing that my three children would grow old without me being there to guide them," she said. "I really wanted to get to my 50th so that I can actually see my oldest son through most of his HSC year and see him graduate." At the moment, she's working on starting her own business designing and producing medical devices and hopes to make it to her 50th birthday so that she can see her eldest son graduate from high school. Now, she hopes that her story will encourage others to think twice before judging those with lung cancer.